Hey moms (and anyone else), once you pack the kids off to school, swing by the church for a Prayer & Projects morning. 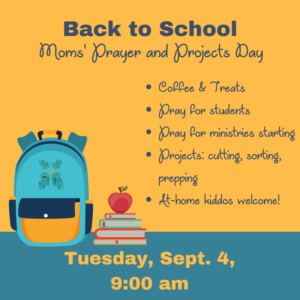 We'll have coffee and treats, lift up our students and ministries in prayer, and work on small projects that will hep children's ministry and preschool. Bring your younger kiddos along. Retirees, stay-at-home parents, homeschool families...we'll take all of you! Be a blessing to our church by working on cleaning and maintenance needs that our part-time custodian can't get to. 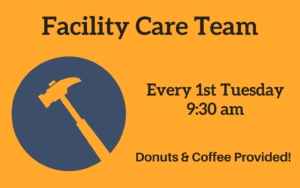 The group meets every first Tuesday at 9:30 am. Join us!